When 8 years old I learned about Mount Everest, and ever since I have dreamed about climbing up there. When I became middle-aged and sensible I thought that it's impossible. 2012 when I turned 50 I suddenly got this crazy idea to fulfill my childhood dream. Now, almost 2 years later, after studying, training, researching & finding solutions, it seems possible! If things go well I will summit in May 2014, if things don't go well I will hopefully do it another year. If you want to follow me vie e-mail updates you can subscribe to them. What's next? Will I go back to Everest? I thought I will be saving money again for the next 30 years for a new try on Everest. To my surprise Radio Nova called me the day before yesterday, late in the morning when I was still in Kathmandu. And there Enbuske & Linnanahde chatted for a while with me, it was earlier in the morning for them. They were so talkative it was hard to get anything said, I usually have a lot of things to say. While chatting away they promised to help me to get sponsors so that I could try again in a near future. They thought that a dream I have had since I was 8 years old is something that needs to be fulfilled. So maybe I don't have to wait an other 30 years? Wow! The climbing license that I have is now valid for 5 more years. This was part of the promise of the Nepalese government when they shut down Everest this year without literally shutting it down. Literally forbidding climbing would have caused a lot of pressure to pay back the license fees. Promising a 5-year extension was easier. Greetings from Delhi, soon back in Finland for Wappu! One of the funniest memories I have from this trip to Everest is from when I arrived back in Lukla after the long but quick two-day hike from Everest Base Camp. I actually made it in less than two whole days from EBC to Kathmandu. There have now started to arrive people who started a few hours after me, after the meeting where the season was basically cancelled, but took five days. Wouldn't have believed that some weeks ago, how small things can make me happy! Being exhausted is not bad for me, being tired is. Because I had never been truly physically tired. I noticed this when climbing Island Peak. I carried in addition to my own gear also Jessica's stuff, crampons, harness, climbing stuff like jumar, carabiniers, descender, ice axe, drinks and food for 12 hours. After several hours at 5600 meters, around 3 A.M. I noticed that Jessica looked very tired and for the first time in my life I noticed that I was also. I have participated in really many different endurance sport competitions. When I do, I always take the most serious sprint to the finishing line. I have been exhausted and felt like I will die, but I have never been tired. Always after some breaths and some moments I have felt I could do the whole thing again. Now at the steep slopes of Island Peak I was tired. I wasn't sure whether I could do it. And the terrain changed really to a most challenging one. One step, 10 centimeters wrongly placed, and you could have been dead. Finally I persuaded Jessica to turn back down. She is no mountain girl with an obsession to summit. She had been really brave though. I was admiring her going all the two weeks. Now she was nice enough to agree and bravely went down alone in the darkness. Up there, hand on the rope, harness attached. I continued to the summit. The backpack was lighter now because we stored Jessica's stuff in a rock-hollow. I was the only one summiting with heavy Everest +8000 boots. That was hard, but not impossible. I was the second in the team back to the local base camp, even carrying back Jessica's stuff from the hollow. When coming to the tent I noticed that I was really, really tired. We were supposed to continue dawn after an hour to a lower village, Chukkung, 4700 meters. I thought that I would have to go on strike and rest for a while. It is terrible to be tired that way when you don't recover and regain your energy. I needed to live for 50 years to understand that. I feel so sorry for all the people I have forced to push on and continue when hiking, skiing, swimming, running, paddling or rowing. Tommi, my kids and most of my best friends must have suffered from that. Being tired is the most terrible feeling I could imagine. That scared me. The journey ended happily, for my part anyway. I ended up using a magic potion. Leader Food my sponsor, had provided me with something called "Nitro boosters". A powder to be added to a cup of water. 60 minutes and you start running. When the magic powder started effecting me, I passed the couple of men in our team, by running. Jessica was laughing out loud and the men, you should have seen their faces! I continued running to Chukkung, normally 2 hours, now done in one. But that wasn't really fair. Leader, though, says that the drink I took is totally legal and doping free stuff. But I think you shouldn't use something like that too often to maintain that kind of a wow-effect. I never drink even any caffeinated drinks, coffee, tea, coca-cola or energy drinks, so the effect must be stronger on me. 3 days ago I met in Lukla my climbing friend Tembah. He had heard that I was in Lukla and came to meet me at my hotel. He was climbing with us to Mera Peak last September when we had a team, Mihai, Rodica, Tommi and me, as well as Pasang. Streetview in Lukla. Google has, by the way, in their maps photos up to Base Camp and beyond if youwant to take a virtual trip. But there was also a really sad story. I could hardly sleep after hearing it, even after trekking for 12 hours with 3 five minute breaks during the day. Tembah told me that his uncle died in the avalanche a week ago. The uncle had 7 daughters. The mother of the family had also passed away some time ago. Now the eldest of the daughters, 17 years old, is taking care of 6 younger sisters. It is not easy in Nepal for girls and women to find a living. It sounds to me to be too hard a situation for that young girl to manage. I asked Rishi, the head of our expedition company, for how to get some economical help to the girls, if I could find people willing to help. Rishi has started an account for collecting money for all the families of the deceased sherpas, but I asked for a way of helping the 7 orphaned girls specifically. Rishi promised to start an account and give all the funds 100 % to the girls. The account number is here, if someone would like to participate. When helping out you never know how the funds will in the end arrive, but I trust Rishi and find this the quickest way to do something concrete in a desperate situation. Thank you for your email, Johanna. Please tell people to deposit as below account and I will provide to the girls directly. Bank Address: Branch office; Thamel, Kathmandu, Nepal. Another way of helping out is for instance to buy for US $100 a beautiful print from one of 10 photographers who will donate all proceeds after printing and shipping (+ $30 to Finland) , 50% go directly to the widows fund and 50% to educate & train the climbing sherpas. Our tents up in Everest Base Camp, Mine is the third, with the Finnish flag. The goal was to go to the summit. It would have been so nice to get at least to the death zone. To know how it is breath at 8000 + meters altitude. Most people who know me probably think that this returning back home was a huge disappointment to me. I am sure that feeling may come later. But when I made the decision to turn back, I actually felt really happy. It is great to be alive! I was also very happy that my personal sherpa-guides, Pasang & Mingma were ok, it was a close call for Pasang in the avalanche. Mingma, who was also the leading Sherpa of our expedition, said that it is always a great success, if the whole expedition returns back in alive and even in good shape. What else has this project brought? Tommi has together with me created an interesting web page, especially the blog. I write some desperate lines and Tommi makes them ok language. Interesting, not too mean or bitter. I have lots of followers. Thank you all who have read my thoughts and thank you Tommi! I noticed that quite many people seem genuinely to care if I can come back alive and well. That feels very good. Thank you! I still have have many things to share from my trip, especially about the situation of the sherpas and the families of the deceased, so I will continue writing as long as there are things to be said. Turning back was kind of a natural decision for me. I have practised it mentally and also in reality so much. When I for the second time arrived to the Everest Base camp, after summiting Island Peak, the first view was a helicopter with a dead body hanging underneath it. At that moment I made my decision to turn back. I didn't want to ruin the spirit for other team members, so I slept a couple of nights in the base camp before announcing my quitting. But turning back wasn't easy. For a year and half every day I have tried to imagine how it is to climb up a steep mountain above 8000 meters. Many nights I have woke up to a nightmare, I am in 7800 meters, camp 4, in a tent, in the middle of the night, it's -30 to -40 degrees cold, a heavy wind, total darkness. My two sherpa guides, Pasang and Mingma are trying to get me to act faster. I have my down suit on plus lots of other clothes, trying to get out from my -40 sleeping bag. I am struggling to put on my harness and crampons. We should be going on already say the sherpas, vite vite. I am so tired and try to breath. Every movement is like slow motion movie. The most diffiult and dangerous parts of the route are ahead. Daytime I have been dreaming of climbing up a steep rim, the sun is almost rising, every breath is really exhausted, but that feels great. When dreaming I still didn't know how it is when you are dead tired (I know more about that now, I will write about that separately), I never have been as tired as I would have been up there. But now the dreams must stay as dreams for some time. Maybe I start collecting money again. Next 30 years and I will have enough. I will be 80 + , not so many persons depending on me, not so many missing me. I will be free to die in the mountains, if I decide to take a heavy risk. What could be a better way to leave? We are in Lukla, it was a really long hike today but it all went well. Tomorrow a flight to Kathmandu, a few days of organizing things there and then back home vie Delhi. I checked the news and for instance the BBC writes about the situation that "Some local guides are calling for a boycott but most foreign mountaineers remain on the mountain and are still hoping to resume climbing in the next week or so." I got the same sense about the commercial climbers, they probably still sit there and hope for a climb. At least my whole group thought I was crazy to leave and they tried to convince me that the climbing will resume next week. But my understanding is that it's not "some local guides" wanting to boycott, the sherpas really don't want to climb and the environment is now dangerous. I don't want to climb in the current circumstances anyway, for me it needs to be about the joy of doing it, not just an achievement. Let's hope all is resolved in a good way and that climbing can resume next season with safer snow conditions and better ways of preparing the climbs. This morning "Huomenta Suomi" called me for a quick interview while we were in Namche, maybe you can see it in Katsomo. We are on our way to Lukla with Pasang, my other sherpa-guide. Pasang knows how to stroke my ego, he said that from Everest Base Camp to Lukla is a three day hike, but we can do it in two. So we are doing it. The Sherpas, who had another meeting after we left the Base Camp, have decided to cancel all climbing for this year. At least all commercial climbing stops. There are helicopters continuously flying back and forth, either richer clients are taking the heli-route to Lukla or Kathmandu or expeditions are moving some gear already that way. We met 150 yaks on their way up to the base camp, going there to carry things down. It's a huge disappointment, but leaving the mountain now feels absolutely right. I'll be home by next week. The Icefall is still closed out of respect for the deceased sherpas. Together with a Chilean climber we are hiking down to Gorak Shep and from there up to a small peak called Kala Pathar. The altitude on a hill after a first peak (at 5.550m) at Kala Pathar is 5.643m. The view should be magnificent, you can see Pumuri, Nuptse and Mt.Everest. I have spoken as much as I can with the best experts I have found and the message I keep getting from for instance my main sherpa Mingma, is that the conditions are worse and riskier this year because of the amount of snow. There was a new big avalanche yesterday approximately in the same place as the one that caused the deaths and there is more to come from the serac on the West Face. I am leaning more and more toward cutting short this expedition. 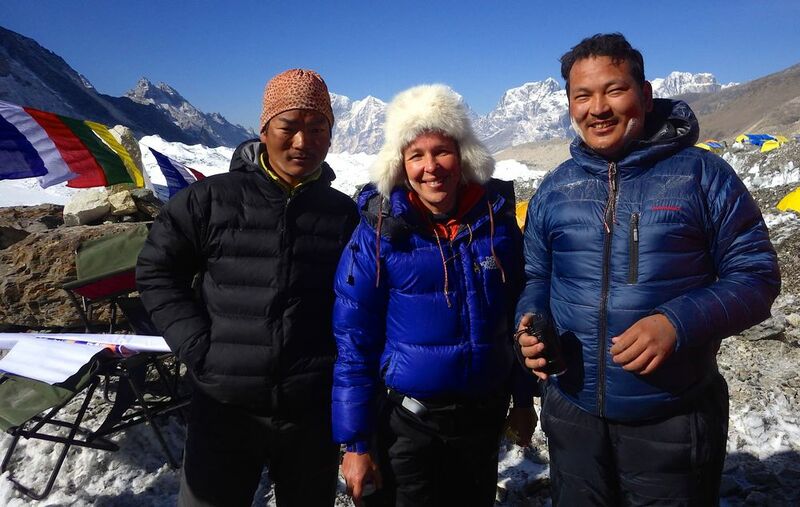 In fact I already told my sherpa Mingma and Rishi, the organizer of the expedition so. The sherpas decided yesterday the they would not participate in any climbing this year. If they keep that decision no-one else will climb either. There are many people, most of my group for instance, who say that the sherpas are just negotiating for better contracts with the government and the commercial organizers and that in a few days they will be ready to go. Many people seem to want to climb. I want to climb too, but it makes no sense to me right now, the risks are too high. The main sherpas are in a meeting thinking about what to do with this season of climbing on Everest. There are rumours in the camp that some teams that lost many sherpas in the avalanche have abandoned their expedition, which is very understandable if it is true. I would really like to see the higher camps and to try to summit this mountain, I have so been looking forward to that. But I also have mixed feelings about the levels of risks I and especially others working with me may have to take if we attempt to climb. The paying customer crosses the Khumbu icefall 6-8 times during acclimatization and the final climb, but the sherpas who help us typically must cross 30-40 times to get all the gear, oxygen bottles, food and other necessities up to the high camps. I'm not sure I want my sherpas to do that. I can see/hear continuous avalanches and it was already a close call for Pasang in the accident that happened. In my understanding the sherpas who are here really want to do this work, they care about the mountains, they care about us and they enjoy their job. But in the end they mostly do it because of the money that can be life-changing for them. If it becomes our money for their lives it is not right. I have not taken a decision myself yet on what to do. If it is true that there is more snow than normally the smart thing may be to come back next year. The climbers with an obsession for a mountain, who can't turn back when the risks are too high are the ones most likely killed and also dangerous for others. I will wait for a few days and see how things develop. The weather here is good, we will practice in safe areas of the icefall tomorrow and otherwise everything is good. I know there are a couple Finns here, I haven't met them yet so I'll try to find them now. On the surface things are normal here in base camp. Well, they are still searching for three missing persons. But everyone looks pretty normal and functions accordingly. If I ask my sherpa-friends whether they know the people in the accident they talk about friends, cousins, in-laws, neighbors and other close people. So the impact on everyone is huge. Personally I'm fine, the first day of rest in a long time, I need it. I showered. Showering means taking a bucket of warm water into a narrow stand-up tent with a shelf for the bucket, opening a tap in the side of the bucket and enjoying the drizzle. I washed clothes too. The weather has been beautiful and sunny during the previous days, but today it's unfortunately snowing and the clothes froze when I tried to dry them. But they will be ok.
To do any serious climbing I need to understand these issues better and be sure that the risks are not abnormally high this year. Climbing Everest has become relatively safe in recent years, but understanding the risks and being conscious of which ones you take and why is crucial. Otherwise life here in base camp is fine, I just had a yak-steak, I'm warm in the tent and physically I'm feeling good. Tomorrow we will go and practice on the glacier. Happy Easter! I hadn't realized it was that time back home until I spoke with Tommi on the phone. I am back in Everest Base Camp. When we arrived today they were carrying bodies down from the mountain. Everyone in our group is ok. Pasang, my other sherpaguide, was working there early in the morning. He climbed to security by a rope from the area where the avalanche hit, others waiting for a ladder to be fixed got caught. I was woken up in the morning by a call from my worried mother-in-law: "Is Johanna ok?" My answer: "Yes, she is ok". According to her plan she will be back in the Base Camp tomorrow and could not have been involved in the accident. According to Johanna's previous report from the Base Camp avalanches are not unusual on the slopes of Mount Everest, she claimed they kept her awake with their continuous noise nearby. Now there has been a terrible accident with an avalanche. The people killed and injured in the avalanche are sherpas preparing the route up to the summit. They have the most dangerous job on Everest. The reports are still conflicting, the Guardian says that the avalanche occurred just below Camp 2 at 6,400m while for instance CNN says it took place just above base camp in the Khumbu Ice Fall. Every year, the route through the Khumbu is set by the “ice doctors,” a small team of Sherpas who take mortal risks to navigate the safest passage through the Icefall, putting up ropes in the steep sections and stretching ladders across the abyss-like crevasses. Crossing the ladders is an adventure for some. For the Sherpas, setting them up is a job. We summited Island Peak yesterday, it is not an easy peak to reach, although the altitude (6189m) is not too much in these surroundings. Let's say it seemed a bit dangerous, there are crevasses, deep holes, steep & narrow snow-bridges and the top really is a narrow peak. We were naturally attached to a rope all the time, but I must say that for 30 people it seemed to to be as strong as a clothes line. Alas, everything went fine and the view was great! Jessica was pretty tired, so we agreed that it was better for her to turn down before the top. Wearing my heavy Everest boots I could not help and carry her gear. The climbing was hard work. Jessica is now returning to Kathmandu with a Danish guy, Casten, and their nice sherpa Laksimon. She will bring nice photos, we will share some on this blog. I'm on my way back to the Everest base camp, I'll probably be there the day after tomorrow. Ncell checked the situation and they say that their network is and has been up, so I hope to get a connection from there. The challenges you meet when hiking a longer route in the mountains often bring out very open and honest reactions in people young and old. When you are tired and hungry, maybe worried about what is going to happen next you don't have the energy to keep appearances. Actually, the very young and the very old don't need a mountain to be honest about how they feel, they tell us anyway because they don't care to hold much of a facade. One thing we got to learn about young children on a mountainside is that they are very motivation-driven. A four-year-old child will easily climb several hundred vertical meters if they want to and on the other hand, two steps are way too many if they don't feel like walking. When living in Bezaudun-Les-Alpes, France we had a 500 m climb from our yard that we did very often, sometimes daily to the school 5 km away, we used to take that route over the mountain. On one particular pique-nique I was carrying a backpack, it was a bit heavy with food & water for 6 people. Tommi was traveling so I was the only adult in the group. Our then youngest daughter, 4 years old, decided that the climb was not so much fun that day and started protesting & stopped walking. I tried convincing her that she should walk, but she stood firm. I resigned to taking her in a carry-bag and suggested to our oldest child Jessica, then 9 years and who now is with me here in the Himalayas, that she take the back-pack while I carry her sister. "Ooo, the Princess is out for a walk with her court! What a beautiful dress she has on! Look at the train of her dress spreading out beautifully! And the chambermaids are helping it stay clean" The little girl immediately got into the role and started chattering about her day as a princess while starting to walk uphill again. This continued for the next 300 vertical meters, I was happy, the Princess was happy and Jessica had again demonstrated her superior leadership skills. Mountaineering, leadership and teamwork have been connected a lot in literature, often in stories from crisis situations. Maybe I will find some fresh angles for looking at these issues from what happens here in the Himalayas in the next weeks. Been to Everest Base Camp, now to Island Peak! We are back down in Dingboche, on our way to Island Peak. After the Everest Base Camp this feels like being on sea-level. I must say that the mountains here remind me of France. Everest Base Camp was an experience, there were lots of avalanches during the night very near our tent. Chocolate, a good book (sudoku, the books are on a kindle) and lots of warm gear, perfect! I had a touch of mountain sickness when going up, I drank too little, carried too much and went too fast, focused maybe more on Jessica's well-being. But I felt much better the next morning and even better today when coming down here to the thick air 1 km lower. Food tastes good again. Jessica is fine, she is doing well in all aspects and she will have a lot of interesting photos with her when she comes home after Island Peak. It could be 5 days or more before I'm back at the Base Camp and I don't know how the connections will work. But I'll keep you posted some way. A guest blog post from Tommi. I will normally not write here, I just upload, edit & put some flesh onto what Johanna reports or what I get from other sources about what's going on up there. I'll write this in the format of a Q&A compiling discussions I have had with friends, colleagues and other people, maybe my perspective has some value for someone. So, some frequently asked questions. Are you afraid / worried that something is going to happen? Not afraid but yes, worried. I can't help worrying a bit, the dangers of being high up in the mountains are real, Johanna has never been above 6400 m and it's probable that some incidents with different levels of difficulties will happen. But I'm not afraid because Johanna's preparation has been really good. Why do you let her go? First of all, she would not be easy to stop. Well, actually we spoke about the issue and she told me that if I asked her not to go she definitely wouldn't. So I really could have stopped the project. But the real reason I want her to attempt summiting Everest is that if you get her talking about the time she climbed Kilimanjaro, leaving everyone else in the dust and being at Uhuru Peak at 6 AM before anyone else, you will see her eyes light up and her voice go a bit dreamy. She sort of moves to a different level of existence and she is genuinely very happy. Forget about getting married or having the kids, those may also be important moments, but for her some essential passion seems to be connected to the high mountains. I would not want to kill that passion, I want to see it live. Before the Kilimanjaro trek I was actually much more worried, because I did not know if she could give up the goal of summiting while having some form of acute mountain disease. Back then I told her that I was looking for a new mother for the kids in case she did not return alive. Now I believe she knows how to move the goal of summiting forward in life and turn back in time. She has always been an athlete doing several outdoor sports and thus in fine physical shape for something like this. From this she also has a lot of experience of the forces of nature. She has hiked a lot in low altitudes in the French mountains, and in snow & freezing cold in Lapland. She has occasionally also hiked in at least 50 other different kinds of places around the world. She has attempted some higher mountains (Kili, Mera, Aco) and has always dealt well with the altitude and the thin air. She has participated in several of courses on climbing, arctic conditions, medical aspects of mountaineering and other essentials for survival. She has been to diving and firefighting courses where she has been able to get work done with very low oxygen consumption from the bottles. She has bought good gear for the above 7000 m part of the climb. She has had advice from all people she knows have experience and are willing to talk with her about it. She has spoken with many who have Everest experience. Johanna with Mingma in Khumjung, on a day-hike for acclimatization. Pasang was already at base-camp, organizing. With us we had then also Pasang, a young, strong guide who had his heart in the work and who was always very helpful with any issue. Once we were in a hurry and came to a cold river. Pasang quickly threw his boots off and carried all four of us, one at a time (with our back-packs on!) across the stony river on his bare feet. On the way back he built a stone-path across the river by turning the boulders in the water! We asked for Pasang to be a second guide for Johanna at Everest. At first Rishi declined, because of Pasang's lack of experience at extreme heights, but in the beginning of 2014 he has been somewhere very high and done well there so he will now accompany Johanna for additional security. So, Johanna has two professional sherpa-guides helping her, the three of them will figure most things out and they will be able to deal with issues. The other 6 people in the group also have their guides. They work as a group, but also as individuals. What will she do next, will she go again? If she does not reach the summit this time, I'm sure she will return. If she does; I don't know. I don't think she knows either. It depends on the experience and the shine in her eyes afterwards, I guess. She will focus on work and a project for helping African children get vaccinations. A question I never get, but I will answer anyway: How good is she with security? This is something very few seem to know/realize about Johanna, because they only know the active, outgoing, talkative, quick, brash, fun-loving, bossy (that's now a banned word in the business-feminist part of of the world, but it does really describe her well) and sometimes silly side of her. She is extremely responsible and security-conscious. I would have many hilarious examples, mainly concerning how to do difficult things with little kids, but let's save them for if there is a dry spell in the mountain info. Johanna does not necessarily avoid risks, but she is very conscious of them. She will, if possible, plan & practice for any contingency. She is also very resourceful in a tight situation. She definitely adds to the safety of any group I have seen so far, rather than reducing it. Not all people see this, because she is for instance not always good at following instructions that don't make sense to her or she's not good at doing things slowly and she may seem a rebel. She is therefore sometimes in conflict with people who want to control her for the ease of managing a group. But mostly she is so quick and thorough in her thinking that she is aware of dangers and solutions much before the others around her. The subscription-button I set up yesterday seems to work, my Yahoo-account got today the blog published yesterday, so if you want to get updates that is one possible way. Another is to check Johanna's Facebook page regularly. Johanna mentioned on Thursday, April 10th, that they may not have internet access for a couple of days. So, we have had no contact since then, as planned. According to my understanding they should by now have moved to Johanna's new home for the next 1,5 months, the Everest Base Camp (EBC). The exact timing of how their trek advances may naturally change for many reasons. Handling the acclimatization process well is key for succeeding up there. From the EBC Johanna & Jessica together with their guides and at least one other hiker will move on to Island Peak. Imja Tse, as it is also called is situated 10-15 km to the southwest from EBC as the crow flies, although I guess the crows don't fly this high up in the mountains. Also the hikers cannot take a direct route, they must probably instead return in their tracks to Lobuche and take a trail toward Island Peak from there. That is often planned to be a three-day hike. In the Everest base camp they should have good chances for communication, but it is another question whether they always have the time, energy or electricity needed for it. So they may already have moved on, and if they have had to do that quickly as they spent some extra days when trekking up from Lukla it may be difficult for them to contact us as they must focus on the hiking, climbing, eating, drinking, sleeping, drying and other essentials for survival. Gorak Shep or Dead Ravens is the name of the last little village before the Everest Base Camp. Gorak Shep is situated on a frozen lake with sand on it, so there is a lot of flat space to set up a tent and rest to acclimatize. This was the original site for the Everest Base Camp in the 50's. The name comes from the total lack of vegetation or other nourisment. Johanna & Jessica should be in Gorak Shep about now, Friday morning 11.4. Finnish time. It could be that we don't get a direct report from them today, although they say there is an internet cafe there, with a slow satellite connection. They have the opportunity to hike up Kala Patthar, which is a dune-looking top by the lake that reaches 5550 meters. There is a view of the summit of Everest from there, which the basecamp for instance lacks. People who do the popular trek to the basecamp normally just visit the camp during the day and stay back in Gorak Shep, in a little bit lower altitude and out of the way of the people aiming higher up on the mountain. Lobuche, elevation of about 4,940 meters, is just about the last overnight lodging on the trek to Everest Base Camp. It's getting higher, thinner, colder and rougher. There is still Gorakshep about 200 m higher, the plan is to stop there tomorrow and still have walls around us for the night. But then that's it, living in tents will be the new reality. Looking forward to it!